Sasha Hupka/News Editor Carolyn Singer, a senior majoring in philosophy, politics and law, casts her mock ballot on the Spine at the Democracy Walk. As midterm elections draw closer, posters questioning the impact of New York’s voting laws on voter turnout filled the Spine on Wednesday. The posters were part of the Roosevelt Institute’s efforts for voting reform in New York as it hosted its Democracy Walk. Co-sponsored by the Center for Civic Engagement, the Andrew Goodman Foundation and the New York Public Interest Research Group (NYPIRG), the walk was a way for members to promote critical issues. The Roosevelt Institute, a policy group on campus for undergraduate students that lobbies for better health care, education and economic development in the Binghamton area, has also advocated for funding substance abuse prevention programs in Broome County and promoting initiatives for student entrepreneurs to remain in Binghamton. Brianna Cea, the president of the Roosevelt Institute and a senior double-majoring in political science and philosophy, politics and law, wrote in an email that lobbying for various issues is extremely important because of the upcoming midterms. Cea is also the Southern Tier district leader for the Let NY Vote coalition, a statewide organization of grass-roots groups that fights for the modernization of New York’s voting laws. According to Cea, representatives like State Sen. Fred Akshar, who serves New York’s 52nd district, are in a position to make major changes this year. As students walked along the Spine, they learned about New York’s voter laws and cast a mock vote for early voting at the end. The mock ballots asked voters if the state should make voting fair and accessible for all New Yorkers and whether New York should have early voting. The box of ballots and posters will be delivered to Akshar’s office. Senegal Mabry, the president of NYPIRG at BU and a junior majoring in political science, said he helped volunteer at the event to register people to vote. Rachel DiSibio, a sophomore majoring in philosophy, politics and law, registered to vote at Mabry’s table. According to DiSibio, she is especially interested in voting this year to elect candidates that care about women and diversity. 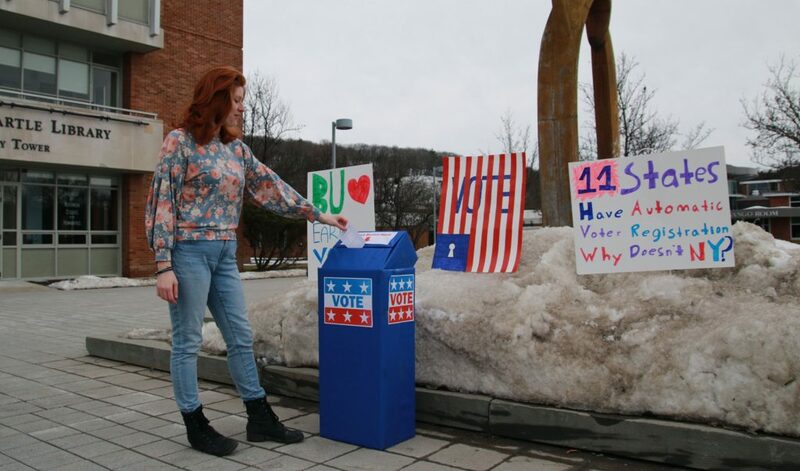 According to Zuzu Boomer-Knapp, a senior double-majoring in English and anthropology, it is crucial for young people to vote. “I think that voting is especially important for young people because this is the climate that we are going to be growing up into, this is the climate we are getting jobs in and starting families in, so it’s really important to have that say in what you’re doing,” Boomer-Knapp said.